On HF, one of the factors that determine how far your signal goes is the takeoff angle. 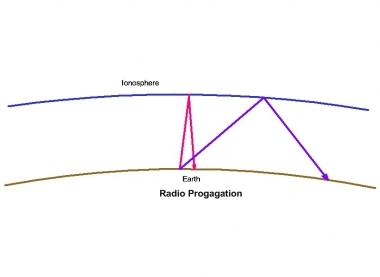 Since HF signals refract off the ionosphere back to earth, the lower the angle, the longer the distance. One of the aims of DXers is long distance contacts and they will often go to great lengths to have a low angle of radiation. But, what if you want reliable communications over short distances? 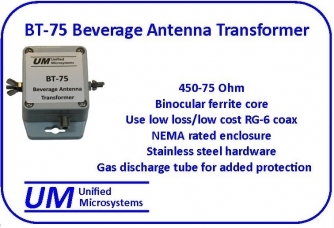 This article looks at an antenna designed for short distances. Figure 1 shows how radio waves travel. They will take off, and assuming the ionization of the ionosphere is high enough, the signals will be refracted back to earth. If the takeoff angle is low like the blue signal, it will return a long distance away. If the signal goes nearly straight up, the return distance is relatively short. The half wave dipole is a common antenna on the lower HF frequencies. The takeoff angle of a dipole is dependent on its height above ground. As the dipole is raised, the angle will be reduced. If the dipole is near the ground, the majority of the signal will be more or less straight up. That is the principle of the Near Vertical Incidence Skywave Antenna (NVIS). The impedance of a half wave dipole in free space is about 70 ohms. As it is lowered, the impedance drops. By the time it gets to 7-8’ high, the impedance is down to about 12 ohms. This will not provide a good match to 50 ohm coax. One way around this is to use a folded dipole. The impedance of a folded dipole is about 200 ohms. The impedance of the regular dipole dropped by a factor of 4 when it was lowered to 7’. Starting at 200 ohms, and reducing it by a factor of 4 gives you 50 ohms, a perfect match! A folded dipole is the same length as a regular half wave dipole, but it is made of twin lead. The ends are shorted. One of the conductors is cut in the middle and the cut ends connect to the coax braid and center conductor. It is also a good idea to put some ferrite beads over the coax to prevent current from flowing on the outside of the coax and messing up the pattern. Since the dipole is so close to the ground, it will induce currents in the ground. This will result in losses. Laying wires on the ground will help reduce these losses. Figure 1. Effect of take off angle on distance covered. My interest in the NVIS antenna started at an ARES (Amateur Radio Emergency Service) meeting. The local Red Cross liaison was asking what we could do to provide communication outside the usual 2 meter VHF range and if anyone knew anything about the NVIS antenna. No one did, so I thought I would investigate them. After some reading I decided to build one and make it available to the local ARES group in case of an emergency. Since my primary interest in ham radio is contesting, and since the annual Field Day exercise was only a few weeks away, I decided to give it a try on 40 Meters. 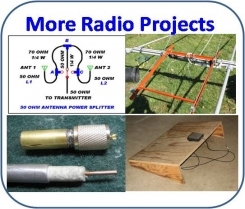 The intended purposes of this antenna required that it be portable and quick to set up. I decided to use fiberglass military mast for the support. Two sections will get the antenna up about 7’ which is perfect. I used a PVC pipe Tee as the center section support. 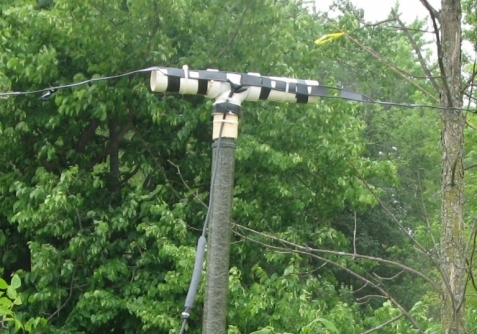 The center section of the dipole is taped to the TEE. Tie-wraps would be better for a permanent set up. RG-58 is the coax since it is not anticipated to be used with more than 100 watts or so. Set up is simple. A 3’ piece of pipe is driven half way into the ground. The PVC Tee with the dipole is slipped on top of two sections of mast, and the mast is slipped over the pipe. The dipole is unreeled and stretched out. Two more pipes are driven a couple of feet past the ends of the dipole and two sections of mast are put over each one. The dipole ends are tied to the ends of the mast with string. The weight of the dipole will tend to pull the end poles inwards, so the end poles are guyed to keep them straight up and the dipole horizontal. 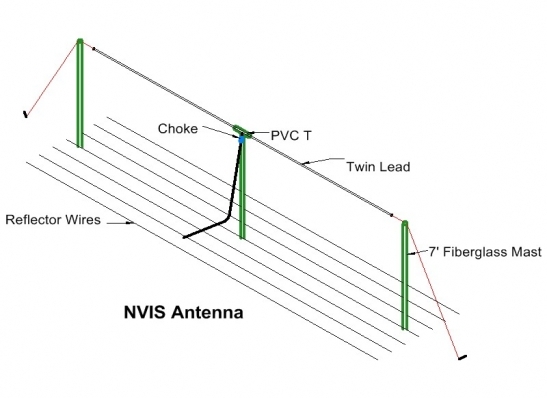 Most of the literature shows the NVIS using 3 reflector wires. When I set it up in my yard for initial testing the ground was extremely dry and I had trouble getting a good match with just three wires. It got a better match with 5 and very good with 7, so that is what I settled on for mine. The wires are about 4’ longer than the dipole. For quick set up they have loops tied in the ends and a black tape marker in the center. The wires are unreeled and the center placed next to the center pole. The ends are stretched out past the end poles. Small cut dowels pushed through the loops at the ends into the ground hold them in place. The other wires are set out at about 2’ increments. Note that no effort is made to “ground” the wires. They are simply laid on the ground. I can set the NVIS antenna up in about 15 minutes by myself. Having a couple of helpers makes the job go even faster. Skywave propagation requires a minimum level of ionization in order for the ionosphere to direct the signals back to earth. With a given level of ionization the maximum frequency will decrease as the incidence angle is increased. The “critical frequency” will be quite low, much below the Maximum Useable Frequency (MUF) that is more commonly reported for radio communications. The critical frequency may not reach 7 MHz at the low part of the sunspot cycle, even during the day. For emergency communications one for the 75 meter band might be more reliable than one for 40 meters. Mine was made for 40 meters since that is the band I typically operate for Field Day. I found the NVIS antenna to be a useful addition for FD. My normal FD antenna farm consists of a dipole at about 30’ (still consider fairly low with a high take off angle) and a vertical with raised radials. In one case I made signal strength comparisons with a known station about 90 miles away. I could not copy him on the vertical. He was about S6 on the regular dipole and a good S7 on the NVIS antenna. I also found that the NVIS antenna is very quiet and often helped produce solid copy when the other antennas had difficult copy. It would definitely not be the only antenna I bring to Field Day, but is a valuable addition, especially considering how easy it is to put up and take down. Although NVIS antennas are most frequently considered for emergency communications by most radio amateurs, it can also have a place in radio contesting. Ones for 40 and 80 meters would be a valuable addition for Sweepstakes and other domestic contests when making more nearby contacts would improve your score.